P.J. Haynie understands the value of his farming heritage. He is expected to do something with his hard-won opportunity. Philip J. Haynie III was driving north on Interstate 35 out of Des Moines, Iowa, with his 9-year-old son, Philip IV, seated beside him. "He spotted my billboard," Philip remembers. The billboard stood to one side of the four-lane interstate that runs from Duluth, Minn., to Laredo, Texas, routing travelers and commerce from all over North America. P.J., as family back in Reedville, Va., knows him, was featured in a campaign called America's Farmer, an effort rolled out by Monsanto. The sign featured a large photo of P.J., with the question and answer, "Who grows a safe food supply? I do." That billboard was sure to attract attention. P.J. 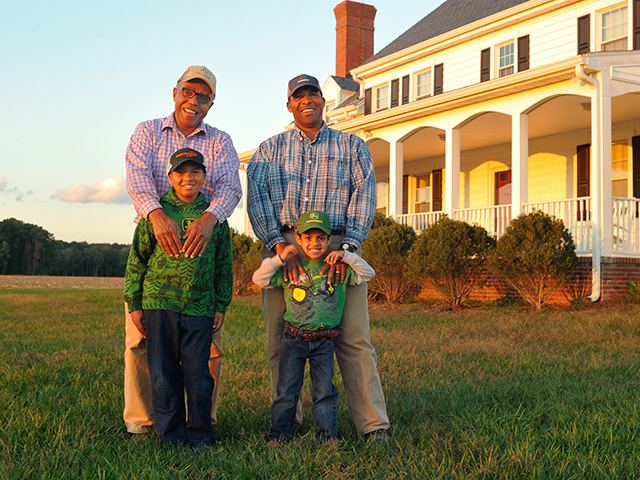 is a successful, fifth-generation black farmer. He is one of a fraternity so small that the entire black farming population of the U.S. would not fill the 50,000-seat Lane Stadium where the Virginia Tech Hokies play their home football games–the university from which P.J. graduated. Actor or farmer. P.J. turned off the interstate at the next exit and backtracked to the pasture that held the billboard. He and the owner of that field struck up a conversation as P.J. asked if he and Philip IV could drive out there to take a photo. "I wondered if you were an actor," his new farmer friend commented, referring to the billboard, "or a real farmer." P.J. and his father, Philip J. Haynie II, work a large swath of acreages, several thousand in all, outside Reedville, Va., in the state's Northern Neck. The Neck is four counties, bounded by the Rappahannock River on the south and the Potomac River on the north. The Haynies farm in all four counties. Many of the fields are small, 30 acres or so. "It's drop the [combine] head and move, drop the head and move," he says. The farthest field is 45 miles from home. The Haynie farm incorporates technology as many large farms do–variable rate, auto steer and the like. He and his dad plant into the "Neck Land's" sandy soils. The ground is flat to slightly rolling. The Haynies plant a three-year rotation of grains–barley or wheat behind corn, soybeans after wheat, wheat planted after soybeans. The farm is experimenting with double-crop corn. "We've had 200 [bushel-yields of corn], and we've had 20," he says. They prefer 98- to 102-day corn. The farm owns 300,000 bushels of storage. "I am a farm kid from a little town with one stoplight," P.J. says. "I am blessed with the opportunity to do what I do, and I share my fire for farming wherever I go." P.J. is a graduate of Virginia Tech University with a degree in economics, marketing and management. His dad called the young collegiate every morning at 5 a.m., much to the displeasure of P.J. 's roommate. And, Philip II never understood why Philip III rarely came home on weekends to work the farm, as he had done while studying animal science at Virginia State University. His four sisters, Merthia Haynie-Forrest, a doctor of physical therapy; Jennifer Haynie-Morrison, M.D. ; Kimberly Haynie, Ph.D.; and Roslyn Haynie, who works in finance, also are actively involved on the farm. Hometown. Reedville is as far east as you can go in Northumberland County, and the county is as far out as you can go on Northern Neck. Beyond it is the Chesapeake Bay. The small town supports a sports fishing industry and is known for its commercial menhaden hauls–a hand-sized fish processed for its high-protein oil. It is said the menhaden is the fish used as fertilizer for the Pilgrim's first corn crops. Seven miles across the Potomac from Reedville is Maryland. Washington, D.C., is 80 miles north. P.J. runs a long-haul trucking company founded by his father. With a dozen trucks, drivers run fish oil from local processors to pet food manufacturers in the Midwest and up and down the East Coast. He farms and trucks simultaneously. Turn on his auto-track, and P.J. dispatches trucks from the tractor cab. P.J. is married to Lisa. "She went on a date with a country boy in a pickup truck, and it was all over," he laughs. Lisa is a family practice medical doctor. They are raising three children, Colette, Philip IV and Trevor. Colette is interested in farming. Philip has an insatiable appetite for knowledge. Even in the combine, he loves to read and produce numerous drafts of his many inventions. Trevor, who is only five, is fascinated with corn harvest. Love the lord and the farm. "Lisa and I want them to love the Lord, enjoy hard work and appreciate their family," P.J. says. "Our kids have inherited from their family the genetic manuscript to become confident and productive leaders in whichever occupation they choose." He loves his father, who hits the front porch at 5 a.m. and works seven days a week. "We love each other a hundred times a day. We might argue more than that," he grins. "But I'm living my childhood dream. I'm working with my dad." He loves to farm on the Northern Neck. "I can leave the farm and in five minutes be on a charter [boat]," he says. "I eat blue crab off my tailgate." Better, he adds, "I love to be able to park the tractor and go into the house." He can do that because he and his father traded homes. P.J. 's home was originally 25 miles from the farm. It was distance that cut deeply into family time. P.J. and family now live on the homeplace on Whays Creek Road. His father wanted his grandkids to grow up on the farm. "So now they live where I lived and walk the same lane that I did to catch the bus," P.J. says. "I know I made the right decision when I see them riding in the Gator with the dog in the back." The Virginia farmer is an advocate for the work he does. He serves on USDA's Plant Variety Protection Act board, the National Black Growers Council as secretary-treasurer, and on the Agricultural Advisory Council for Virginia's first congressional district. P.J. maintains strong roots to higher education. He serves on the College of Agriculture and Life Sciences Advisory Committee for both Virginia Tech and Virginia State universities. All this work has caught the attention of the nation's highest levels. The White House recognized him as one of its Champions of Change. This is a program that recognizes "ordinary Americans who are doing extraordinary things in their communities." A 'light bulb' moment. While at Virginia Tech, P.J. was president of the Minorities in Agriculture, Natural Resources and Related Sciences chapter–and soon found he was the only farmer in it. That was a lightbulb moment. There were not many like him–neither farmers, nor especially, minority farmers. Land means everything to farming and ranching families. For the Haynies, it is even more so. Their holdings are hard won, and their soils are profoundly linked in a visceral way to the existence of this family, to this farm and to black farmers. Here's what Philip II told a reporter at The Washington Post for a 2004 article called "The Promised Land." "You know what my gravest fear for black people is? That we end up on reservations. That we won't own any land. We're consumers, not producers." Promised Land traced the personal story of Philip II; the fast growth of the Haynie farm and then bankruptcy; the discrimination suit against USDA (since settled); two unexplained fires and bullet holes in a tractor; how P.J. himself fought and won a discrimination suit with USDA. Black farmer genocide. Numbers tell part of the Haynie story. There are 2.2 million principal farmer owners in the U.S, according to the 2007 Census. A principal farmer or rancher makes the day-to-day decisions. There are slightly more than 30,000 black principal operators, 1.4% of all farmers and ranchers in America. Ten times as many women are principal operators. "There has pretty much been a genocide of black farmers," P.J. says. Farming is tough enough. Discrimination often makes it impossible. That took a toll on the generations. "If a son saw his dad struggling, why would he stay on the farm?" P.J. asks. The story unflolds in history. There were 926,000 black farmers in 1920. They farmed 16 million acres. Today's black farming community tends 3 million acres. Most live in the South, have small operations–the average is just more than 100 acres–and most continue to struggle. P.J. 's home Northumberland County has 129 farms with sales of $11.9 million, the majority of it corn, soybeans and wheat. Most black farms here gross less than $20,000 annually. The Census of Agriculture records 12 black farmers in Northumberland and fewer than 60 black farmers in all of the Northern Neck. This fifth-generation farmer knows the stories that bring those numbers to life. His great-great grandfather, Robert Haynie, was born on the Northern Neck in 1823, a slave. With freedom after emancipation, Robert, who was a minister, bought 60 acres and farmed it. He also built the Macedonia Baptist Church, where the Haynies worship to this day. "He had to teach himself carpentry," P.J. says. "You can look at the church, see his work, and appreciate the craftsmanship he used." Crisis of credit. Those surely were hard days. And there were more through the generations. P.J. 's father certainly lived through many as his farm fell into bankruptcy. "Dad had to report information about the farm [to USDA in return for credit]. A lot of it was competitive information," he says. At some point the county ASCS committee told Philip II that he had outgrown programs set up for family farms, and he was denied new credit. P.J. is firmly of the belief that the quick growth and size of the Haynie operation documented in those USDA credit reports raised the ire of local white farmers. When Philip went to the bank for credit, he was turned down there, too. USDA put liens on the farm when outstanding production loans could not be repaid. The Haynie farm went bankrupt, and Philip II had to rely on his extended family for help to continue farming the little that was left. That included help from P.J. "My dad was determined not to be overcome. All he wanted was a fair shot. I saw him struggling. I was determined to help him out." During college P.J. was working an internship as an assistant commodities broker in Omaha, Neb. –it beat that barley dust on the farm–when he heard harvest was going poorly back home. "I packed up my car and left Omaha. I drove straight through to Blacksburg, Va., and got home at 5 a.m. Dad was sitting on the steps tying his boots. We hugged and kissed. 'Well hell, let's get to work,' Dad said. I worked all day in what I was wearing, didn't even unpack the car." The car was unpacked, eventually. But the partnership between dad and son went on to rebuild the Haynie farming and trucking operation. P.J. holds close the lessons taught to him by his father. "Wealth is generational. When you lose the land, you have lost all that generation's wealth. I saw my father struggle. But I'm determined to help him out," he says. "I am expected to do something with my opportunity." To look ahead: "It's my duty to install in my young ones a passion for farming and an appreciation for what Dad and Granddad went through. That we have a job to feed the world," P.J. says. To serve the community: "I want to show the kids at church and in my community that it is not all cows and plows. I tell them about the importance of education and how they have to study the science and technology, that [I use it] to put food in their bellies." To support black farmers: The Haynie farm and other National Black Growers Council members host members of Congress who come out to discuss minority farming issues. The Congressional Black Caucus has a point of contact in P.J. and his father. lead by example. "[Black farmers] are mostly small, to midsize. They have limited access to information. The 60-year-old black farmer may have limited literacy and computer skills. He needs his granddaughter to read a pamphlet so he can understand it," he explains. "So we show them how to sign up for programs, to engage with [USDA]. You may not trust USDA. But you are leaving [money] on the table," he tells them. The National Black Farmers Council's mission is to improve the efficiency, productivity and sustainability of black row-crop farmers. The group conducts model farm field days. "We help break the ice about technology," P.J. says. "Even if you use GPS to soil sample, that's precision farming. That's a beginning." There are long days on the Haynie operation, both in the fields and in meeting rooms. The farm still embraces Robert's 60 acres. "I think he would be thrilled that I'm here carrying on the legacy. I'd love to show him what we're doing," P.J. says. Time moves forward on the Haynie farm. The day starts at 5 a.m. Father and son have little time to look back. The land worked by the sweat of a former slave, a preacher, a self-taught carpenter and a farmer still helps to feed the world.